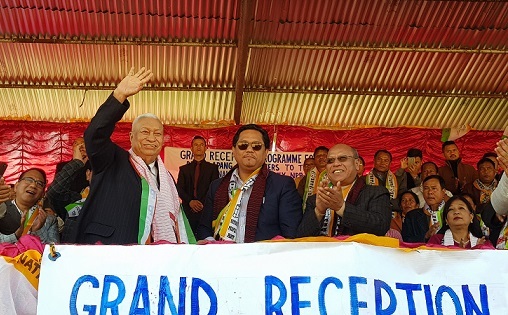 The National People’s Party (NPP) led by Conrad Sangma has entrusted veteran politician D D Lapang with an additional responsibility of party’s regional coordination committee. The former Chief Minister of Meghalaya who recently joined the NPP along with his supporters in R- Bhoi district of the state, has already been functioning as the chief adviser to the NPP-led Meghalaya Democratic Alliance (MDA) government. Lapang’s appointment at NPP’s NECC chairman. 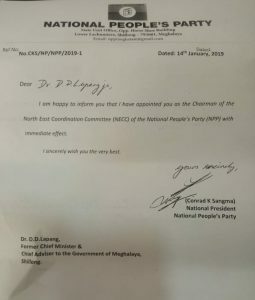 He has now been appointed as the chairman of the North East Coordination Committee (NECC) of the NPP by the NPP’s national president and Chief Minister of Meghalaya, Conrad K Sangma. Though his appointment as the chairman of the NECC of the NPP was effected from January 14 last, the appointment letter was circulated on Tuesday. D D Lapang left the Congress and joined the NPP on December 10 last year, few weeks after he was appointed as the chief adviser to the MDA government headed by Conrad as Chief Minister. He was appointed the MDA government’s chief adviser almost immediately after he had quit the Congress. The veteran politician who had all along been associated with Congress throughout is long political career, left the Congress in a huff citing that there veteran like him were being sidelined in the Congress. The former Chief Minister of the hill state had apparently made elaboration confabulations with his supporters and other like-minded political leaders of the state before beginning his innings in the NPP which accorded him a grand welcome.